Public speaking is seldom if ever an entire job description, but dynamic and well-prepared speakers are highly valued by employers and tend to earn leadership positions and important client contact roles. 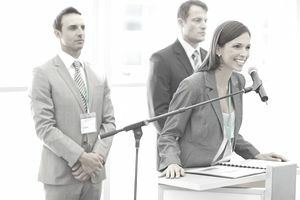 Anyone whose job involves communicating, teaching or persuading will do a better job if they have public speaking skills. The art of public speaking comes into play, not only in the delivery of speeches and truly public talks, but also in professional presentations, training events, and motivational speaking. Consultants, training, managers, clergy, sales representatives, teachers, and others, all have a reason at times get up in front of others and speak. Effective public speakers are in an excellent position to get their messages across in the workplace. A lackluster speaker can make a solid product or proposal seem less than enticing while a polished speaker can add allure to an otherwise mediocre proposition. Most professional level roles require some amount of public speaking to carry out functions like presenting findings, pitching proposals, training junior staff, and leading meetings. Public speaking is a skill, but it is also a collection of skills. Lists like this one can help you name some of these skills so you can identify which jobs require the abilities you have. Be sure to read job descriptions carefully, because even very similar positions can have different requirements, depending on what the hiring manager is looking for. When you apply, you can use these skills as keywords in your resume or other application materials. Hiring managers sometimes scan through applications looking for these keywords to make an initial cut, so it can be important to make it obvious from the beginning that you have the sought-after qualifications. Then, use your cover letter to highlight some of your relevant skills. Be prepared to give examples of specific times you embodied these skills during job interviews, because your interviewer is likely to ask. Of course, each job will require different skills and experiences - hiring managers vary in what they look for, even for very similar positions in the same industry, so make sure you read the job description carefully before applying. You may also want to review our lists of skills listed by job and type of skill. When you want to highlight your public speaking skills in your cover letter, resume, or even during an interview, be sure to go beyond stating that you have "public speaking skills." Go into detail about which aspects of public speaking you are good at, and provide specific examples of your skills and expertise. Clear Articulation: Of course, public speakers must be able to speak well. Enunciate clearly, speak loudly enough, and use good grammar without a lot of verbal crutches, like “um.” It helps to be able to speak well in ordinary conversation, but public speaking is a kind of performance and as such, must be practiced and prepared for. Memorization itself is usually not necessary, because most people can speak extemporaneously to some degree, but you must be familiar enough with your material that you don’t pause excessively, repeat yourself, or stumble over your words. You also need to be able to pace yourself so that you finish on time, neither early nor late. Engaging Presentation Style: Presentation style includes vocal tone, body language, facial expression, and timing. The right style can make a talk that could have been boring come out interesting and engaging - even funny. Assessing the Needs of the Audience: Some audiences want a lot of technical detail; others don’t. Some enjoy humor; others won’t. There are jokes that work in some crowds but not others. To draft a successful talk and to adopt the appropriate presentation style, you need to be able to assess the needs of your audience. PowerPoint Skills: PowerPoint is a popular software used for creating slides. Not all public speakers use slides, but slides are so common that doing without them is sometimes called “speaking naked.” You must not only understand the technical aspects of using the software, but also must have the artistic ability to create slides that are aesthetically pleasing and easy to understand - or, you must work with a collaborator who can do so. Either way, you must know how to integrate your slides smoothly into the other aspects of your presentations. Composition Skills: Whether you write your talk up ahead of time or work extemporaneously, you must be able to construct talks that are rational, coherent, easy to understand and cover all the points you want to hit. Storytelling and humor help, and you must know how to use them. Public speaking is not only a form of performance art it also requires writing skills.